Hello, I would like to share several of my notes with a specific notebook shared with me by someone else. I see an option only to share one note at a time and only by e-mail, rather than with a choice to select a notebook of where to place it. Thanks for your help. ALSO: I thought that I finally was able to edit in the notebook shared with me, but it still is not allowing me access. Everything I try to do in the notebook shared with me is being done within my own notebook, rather than the intended notebook. You can only share one note at a time, or one notebook. 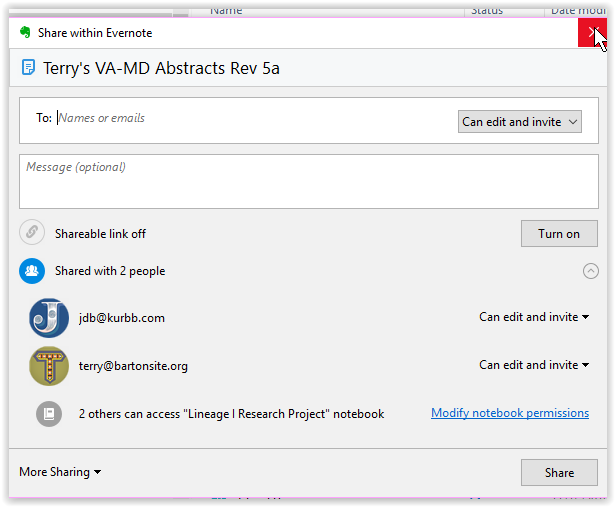 Which Evernote client are you using? Windows, Mac? Android? iOS? Web? I would like to share several of my notes with a specific notebook shared with me by someone else﻿. Are these the people with whom you want to share? If yes, then this is the sharing mechanism to use. You don't ned to look at the other options. >>I thought that I finally was able to edit in the notebook shared with me, but it still is not allowing me access. Their are different access levels. Do you have edit access to the shared notebook? I have full edit access, as far as both I and the other parties know. I am using Windows 10 and Chrome browsers. I have tried to share one note at a time. Hello: I am using Windows 10 on my computer and Google Chrome browser. I now am able to enter new notes and edit notes in the notebook shared with me. However, I still cannot figure out how to copy a note from my personal notebook to the book shared with me. Please walk me through copying one note at a time or moving one at a time, whichever will work. Thanks. Right click on the note in the note list. You should see a menu with items "Move Note" and "Copy Note". If you are allowed by the owner to moce/copy notes into their notebook, you should be able to use those commands. Drag/drop fom the note list into a notebook on the left panel, should work to move it, as well as using the notebook selector in the note panel. You can also move multiple notes at a time by selecting them in the note list, and using the "Move Note" control in the multi-select note panel. Hello: When I right click on the note in the note list, I do not see the menu with "Move Note" and "Copy Note." I receive a menu for "Back, Reload, Print," etc. I also tried left clicking and multiple other ways. I then switched from Chrome to Firefox, where I did have a menu more similar to what you describe, but then it seems that the note never does copy or move into the other notebook. I definitely have permission to edit their notebooks. Success! I went back into Firefox and downloaded a new version of Evernote. That seems to work. The menus you describe pop up now, and the notes seem to be copying. Hello: When I right click on the note in the note list, I do not see the menu with "Move Note" and "Copy Note." I receive a menu for "Back, Reload, Print," etc.﻿ I also tried left clicking and multiple other ways. I then switched from Chrome to Firefox, where I did have a menu more similar to what you describe, but then it seems that the note never does copy or move into the other notebook. I definitely have permission to edit their notebooks. OK, you are not using the Windows Evernote client, you are using the web version. That's different. I'm guessing that you are using the beta version of the web client; you should switch to the earlier version, where you can change notebooks.